As newspapers discussed the killing of Osama bin Laden by American strike troops, one topic mentioned was the inconsistency of the reports made by the United States government on what actually happened. Was Osama armed, and engaged in fighting against the troops invading his home? Was he unarmed and not fighting? Did he use his wife as a human shield? Which son was killed? Sequential reports from the government on these and other matters provided contradictory accounts. An article printed in the Santa Cruz Sentinel newspaper, on May 4th, was typical, listing some of the major differences in what the public had previously been, and was then being told. 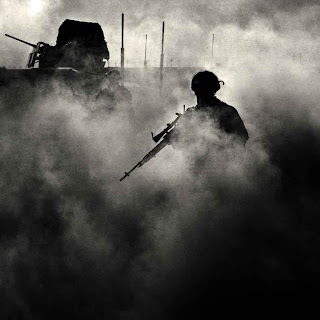 According to the article, White House Press Secretary Jay Carney attributed the discrepancies to the "fog of war." For me, that "fog of war" phrase called up the documentary movie with that title, about Robert McNamara and the War in Vietnam. (If you haven't seen it, and would like to, The Fog of War is available on Netflix). The movie was well reviewed, but I remember how much I disliked McNamara's attempts to justify what both he and the nation did. The "fog of war" excuse has a ring of the meretricious, to me, thinking of the second definition of that word, as presented on Dictionary.com. There is, I find, a legitimate understanding of the "fog of war" phrase, reflecting real and physical conditions on the battlefield. I'm sorry to say, however, that the use of the phrase by the White House Press Secretary, to explain differing reports presented to the public, seems to me to be nothing other than a series of statements "based on pretense, deception, or insincerity," which is that definition of meretricious I mentioned. Given my own personal reservations about what was done, and about what the consequences of our government's actions will be, I am not inclined to accept the idea that the United States government acted in a "fog." If it did, it shouldn't have acted at all, because the consequences of the killing of Osama bin Laden, done in our name, are going to be significant. The actions of our governmental leaders, and those who executed their policies, should have been based on a clear understanding of what the exact objectives were, and exactly what was authorized and intended. And the explanations presented to us should be clear, too.